Eating grapefruit reminds me of my sister, Emily. Hi, Em. Emily likes to eat grapefruit with sugar. Or rather, she likes to eat sugar with a bit of grapefruit underneath. At least, she did as a six-year-old. When Casey and I sprinkled sugar on top of our grapefruit halves, Emily unabashedly dumped spoonful upon spoonful on top of hers. But Emily’s always been bold like that. Ever the middle child, Emily’s always been the bravest and brashest of us three Gilbert girls. Definitely the loudest. The most generous. A little bit of a spark plug. A tough cookie. 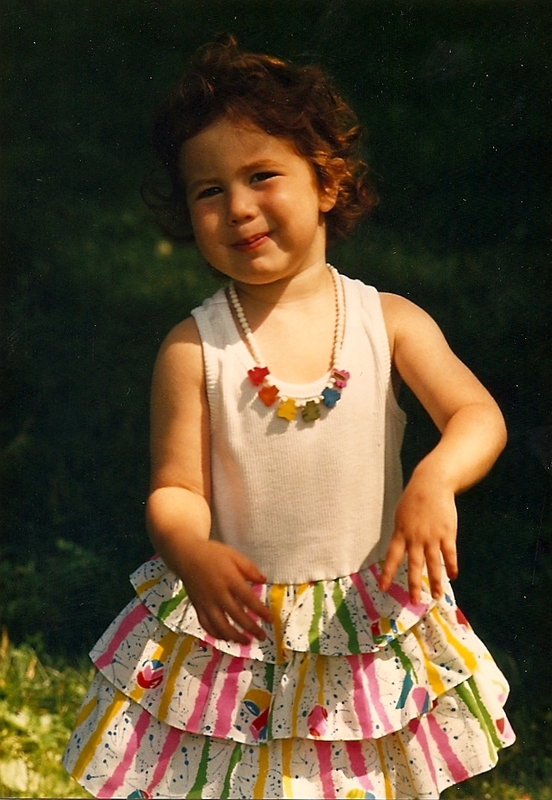 When we were little, Casey and I, like most other kids in the neighborhood, mostly chose to wear a standard uniform of shorts, t-shirts and sneakers, but Emily insisted on wearing patterned tights, layers of jewelry, and dresses with skirts on top. Skirts over dresses. (She now works for the apparel company Anthropologie, so there you go). Emily has a gorgeous shock of red hair that stands out from Casey’s and my more ordinary brown, and boy does that girl have a mouth — it’s razor sharp. You don’t want to mess with Emily. It’s like this: you know those times when you want to say something bold, to put someone in their place because they’re not treating you the way you should be treated, and you just can’t do it — because you’re frazzled and confused and exasperated and the words won’t come out? Because they’re stuck in that bottomless place that all perfect stand-up-for-yourself phrases go? And later, hours later, you finally find the words you’d like to say but it’s entirely too late to use them? Not a problem for Emilygirl. Emily will put you in your place so fast, with such vehemence, you won’t be able to do anything but apologize. And she’ll probably do it in such a sweet voice that you might not even know you just got served, but you absolutely did, and you’ll be sorry. Emily’s someone you want on your side. I’d just like to say that I’m glad she’s on mine. And I hope she’ll reconsider her recipe for grapefruit. This isn’t exactly a recipe; really it’s just grapefruit, and you don’t need me telling you how to eat one. Still, I’m bossy that way, and I’m hoping you don’t mind. 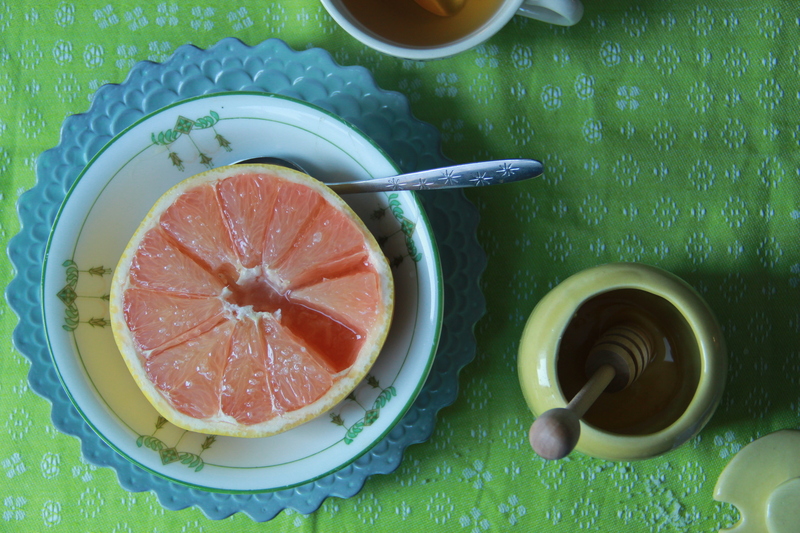 I love the way the honey and salt layer sweet and salty notes over the tart and tangy grapefruit; it’s a healthy, refreshing and surprisingly satisfying breakfast or snack in the winter months, when grapefruit comes into season. Look for unblemished grapefruits that feel very heavy for their size — this means they’ll be full of juice and ready for eating. Use a small paring knife to gently release grapefruit segments from the rind, first going around the fruit in a circle, and then tracing the individual segment, to loosen. 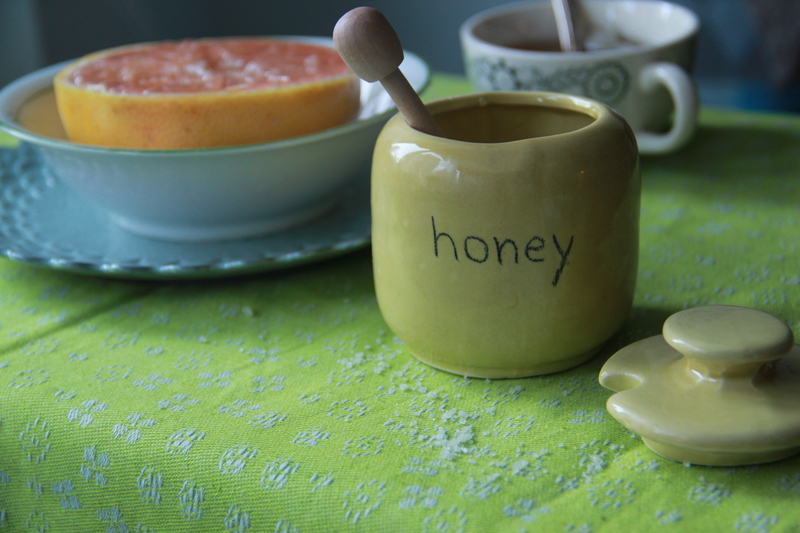 Drizzle the honey atop the juicy fruit, and sprinkle with coarse salt. Enjoy immediately. 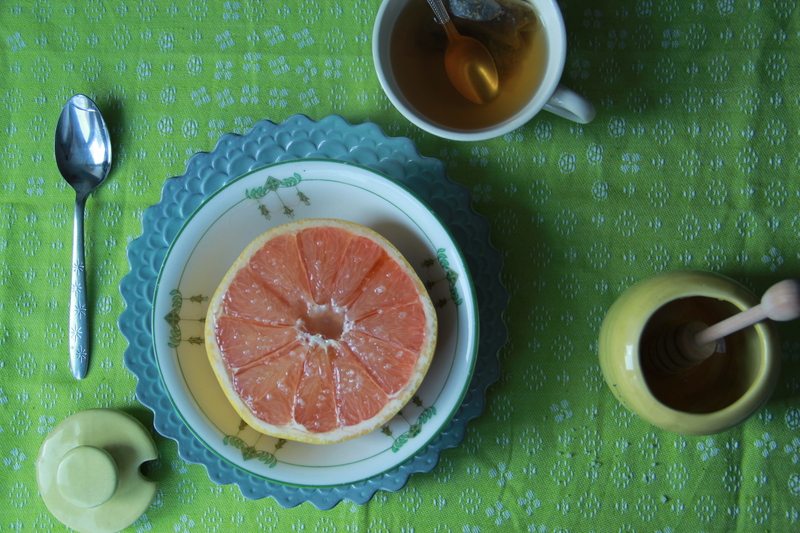 Ok, so it’s grapefruit hidden in Emily’s typical morning mound of sugar. That actually makes sense. either grapefruit or pancakes – tough to be sure, isn’t it? I read your blog a lot, but never comment. I just wanted to tell you that your photography is gorgeous and your food always looks delicious! This may be my favorite post of all. Of course, all the posts are fabulous, but this one is special. Keep up the entertaining and food filled posts. The problem is, I’m always hungry when I finish reading your blog. who is pe? My secret admirer?!? Me too kgro. Me too! one of my favorite girls describing one of my favorite girls. 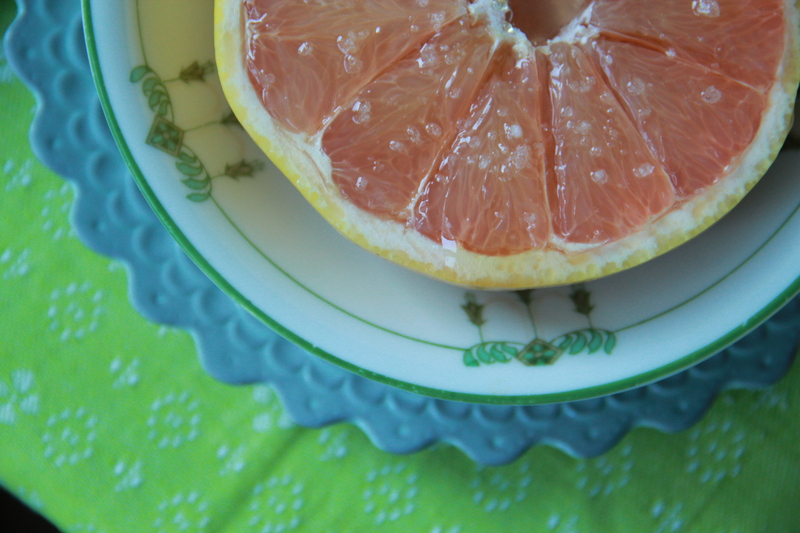 how much better can it get?… other than eating sugar with grapefruit. i’ll think of Em whenever i eat a grapefruit now. nice. Wait. I think I remember when Emily looked like that. So so cute. UM, this is amazing! embarrassingly, i too am tearing up with my sis. that pic of emmy is incredible. Molly, you write as well as you cook and I love the way you use food to lead you to family memories and stories. It’s a real talent! Molly I adore your blog and Emily I adore you. This is so sweet. Skirts over dresses on wee Emily Gilbert is so perfect!